At Labour's conference this year, Lord Mandelson urged his colleagues to fight the next election as insurgents, not incumbents - a strategy which is perhaps rather easier to follow in Scotland than across the UK as a whole. That's because the SNP are the governing party in Edinburgh, forming a minority administration with one seat more than Labour in the Holyrood parliament. Last year they overturned a 13,000 Labour majority in the neighbouring seat of Glasgow East on a massive 22% swing. But history did not repeat. The SNP failed to cause a second upset in Glasgow North East, even though they needed a slightly smaller swing to secure victory. In part, that is because they now have a record to defend - and while their honeymoon with the electorate has not exactly turned into a relationship breakdown, enthusiasm may have have cooled since last summer's by-election victory in the same city. Labour relentlessly exploited the decision of the SNP administration to cancel the city's planned airport rail link to portray the Nationalists as "anti-Glasgow". Glasgow North East has the highest unemployment of any constituency in Scotland - though not the UK - so the local residents aren't necessarily demanding a fast link to Scotland's largest airport so they can enjoy a weekend break in Tuscany or a city break in New York. But Labour also made the issue one of much-needed jobs - which would now not materialise because of the cancellation of the prestige project. The SNP, for their part, tried to portray Labour as the party that could not care less about the constituency. 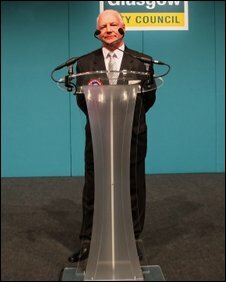 They questioned why there was such high levels of deprivation in areas represented continuously by a Labour MP since before the Second World War (though technically, since 2000, Michael Martin , the former MP, wasn't a representative of the party as the Commons Speaker has to renounce all partisan affiliations). This time the tactic did not work, but the SNP will point to the derisory turnout of 33% to suggest that enthusiasm is not exactly welling up for the UK party of government. 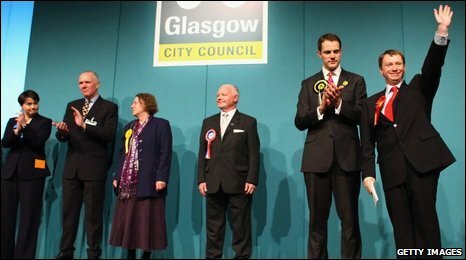 They also say they achieved their best result in the constituency - or its predecessor, Glasgow Springburn - for 30 years. Having felt the pain of losing Glasgow East, Labour decided to deploy much better organisation to protect themselves this time. Funds flowed into the constituency from the Unite trade union (Labour's candidate Willie Bain is a member) and they set up what they call a "virtual" phone bank where union members contact fellow trade unionists to try to persuade them to vote Labour. Union insiders say this is four times more effective than getting the politicians themselves to call floating voters. The same technique will be used in key marginals at the next general election, but, apart from this, there are precious few lessons to be learned in Glasgow North East for next year's UK-wide poll. It is perhaps a measure of the depths of depression in Labour's ranks that they are delighted to hold a seat they have not relinquished since the mid-1930s - though they say they have "gained" the seat because Michael Martin didn't stand under party colours in the last two elections. But, of course, the main challengers at the next election across the UK will be the Conservatives and they are in the region of 10 points ahead in the polls - so other "safe" Labour seats may face a larger onslaught than the SNP could muster in Glasgow. Labour say the Conservatives' performance here was humiliating for David Cameron, but this was never going to be potentially fruitful territory for them. Tories are seen as rather rare and exotic creatures in these parts. But there will be one aspect of this elections which will worry the mainstream politicians at Westminster. Talk to the major parties, and they say expenses was not really an issue - even though Michael Martin was, in effect, forced out as Speaker in the wake of the scandal being exposed. The candidates here all swiftly donned their hairshirts. But disillusionment with the major parties was on display here when the BNP came close to beating the Conservatives into fourth place and finished ahead of the Liberal Democrats. The BNP did not keep their deposit - gaining less than 5% of the vote - but with 13 candidates in all contesting the seat, then voters who chose to protest against the main parties had plenty of other options to choose from. Nick Griffin's supporters will doubtlessly be pleased to have finished ahead of the rest of the smaller parties. Perhaps that was in part due to "People's Front of Judea" syndrome - the tendency of small left-wing parties to split or fall out, so memorably lampooned by Monty Python. Among those challenging Labour from the left, not the right, were with the Scottish Socialists, Tommy Sheridan's Solidarity and the Socialist Labour Party. So this by-election may not be the best guide to the outcome of the next General Election but the winning Labour candidate was quick to claim the result was an endorsement of the prime minister. So when it comes to elections, a vote to replace Gordon Brown as Labour leader before the nation goes to the polls now looks even less likely - his internal critics will continue to denounce him privately, but this result makes it trickier to try to depose him publicly.